Do you want to experience the power of shaving with four blades at a reasonable price range? Do you also want these blades to shave as close to your skin as possible without causing any injuries? If yes, the Panasonic ES-RF31 4-Blade Electric Shaver (Wet & Dry) with Flexible Pivoting Head for Men is the ideal choice for you. Panasonic, already one of the world leaders in electric shavers in the Asian market, has become one of the reputed names globally as well, thanks to its technologically-adept RF series of shavers. The RF31 is no exception to this rule. Experience the power and speed of increased blades and arc-shaped foils as you enjoy the shaver moving smoothly across your face for the well-groomed look. Power of four blades, with the fourth foil designed exclusively to lift hidden and flat hairs; four blades ensures quicker, smoother and more skin-friendly shaving than ever before. It has slit foils to help get at those difficult laying hairs to ensure a smoother shave. Great battery life when charged for 60 minutes fully, it can be used for 65 minutes in the cordless mode. It has a lithium ion battery which also has a 5-minute quick charge. This is so you won’t be left in a situation where you cannot get in a shave when you need to. 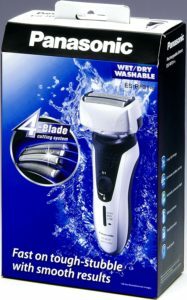 Priced close to £55, the Panasonic ES-RF31 4-Blade Electric Shaver is a good shaver as it packed with technological brilliance. However, it faces charging issues and requires you to keep checking the battery indication manually. If this shortcoming is alright for you to adjust to, this is an excellent shaver that provides you good value for your money. It comes in at 4.3 out of 5 stars with 83% four stars or higher, and under 5% with one star. This electric shaver has tons of reviews and we suggest you look through some of them if there are specific questions we didn’t address you are thinking about buying it.